Place cherry concentrate in a glass. Slowly stir in ginger ale. See how to make wonderfully tart cherry limeade. This is so nice with an Italian dinner... a must have with the little ones around, great for all occasions. 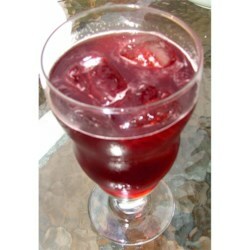 I had frozen fruit cocktail juice on hand and mixed it with the ginger ale. Served at a dinner party, everyone was so impressed! Delicious and so refreshing! The color was very pretty too. I will definitely keep this recipe for baby showers and other events. Really, really good! It's so simple but refreshing and tasty. I used regular cherry juice as can't get frozen concentrate. This is my new summer drink. We loved this, especially me who's struggling with quite the sore throat today. Very good! This sounds good I might use it at my party! !